I can't believe how long it's been since I last blogged, so much for my intention to keep up with this. So much has been happening this fall. "All My Rowdy Friends" went to Houston and will soon be on it's way to Phoenix. Teaser Alert---Kevin has given me our collaboration to quilt, it's AMAZING!!!! I just want to start quilting it, but I have some Christmas presents left to make first. 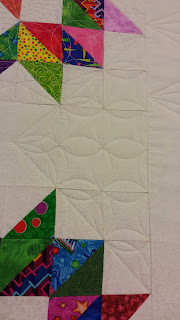 I also decided to do Bonnie Hunter's Celtic Solstice mystery quilt. I know I won't be able to keep up with it totally, but if I get a little of each step done, I should eventually get it all done. Key word - eventually, lol. Luckily I have a couple friends trying their best to keep me on track. This past weekend I had the honor of teaching longarm quilting classes at Hunter Heirloom Quilting outside Warrensburg, in Centerview, MO. The owners, Amy & Joe, some of the nicest people you'ld want to meet, are also Innova Dealers. The shop is spacious, warm, inviting with, best of all, a great fabric selection! I found some that I had not seen elsewhere that I HAD to have! Even my hubby, Bob, picked some out for me. I can't wait to go back, hopefully I will be teaching some more classes for them next year. My students were so much fun, braving the freezing rain and ice. But weather is not going to keep a good quilter in!! A great shop, well worth the trip. Loaded up the quilt, laid on the Quilter's View Film, and started to draw ideas. So, time to start quilting. Lots of ruler work, one of my favorites. Slightly different than the original plan, but I like the design. I like the contrast of the horizontal lines better than the vertical. And then on to the Carpenter's block. 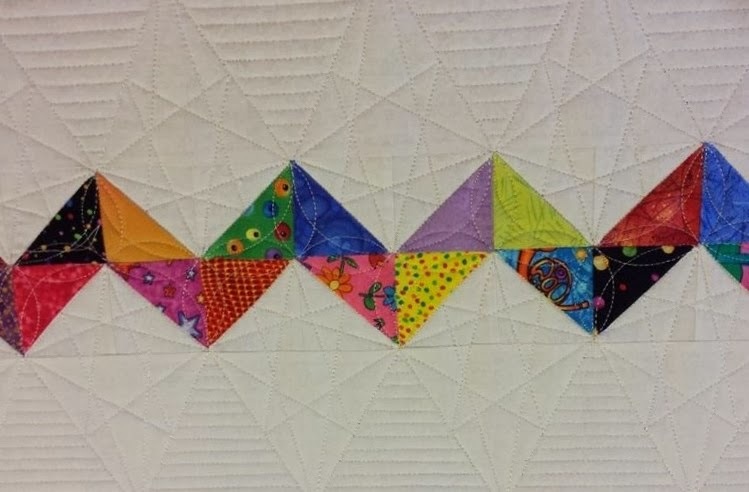 Quilter's View Film and start drawing. I like the contrast of pebbles and the cross-hatching with the orange peel HST. 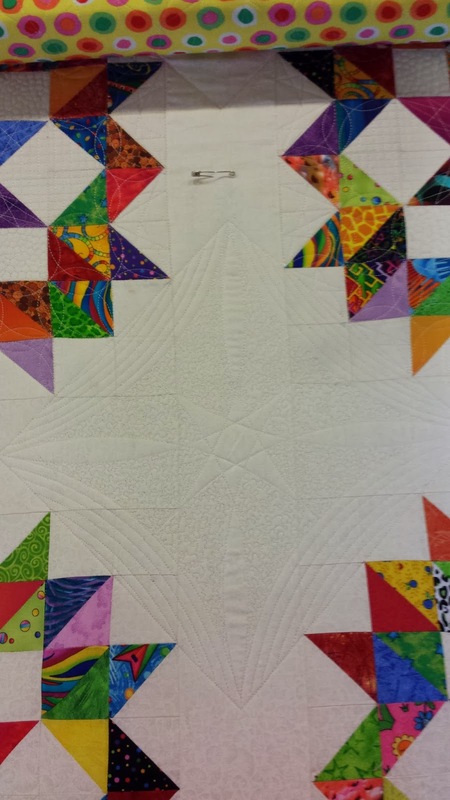 The center star mimics the border design. On to the negative space. I used the same star design from the border in the center of this block. Only with curved lines. Those pesky inset triangles. What to do? What to do? Well, I hope you all enjoyed my quilting process as much as I did. 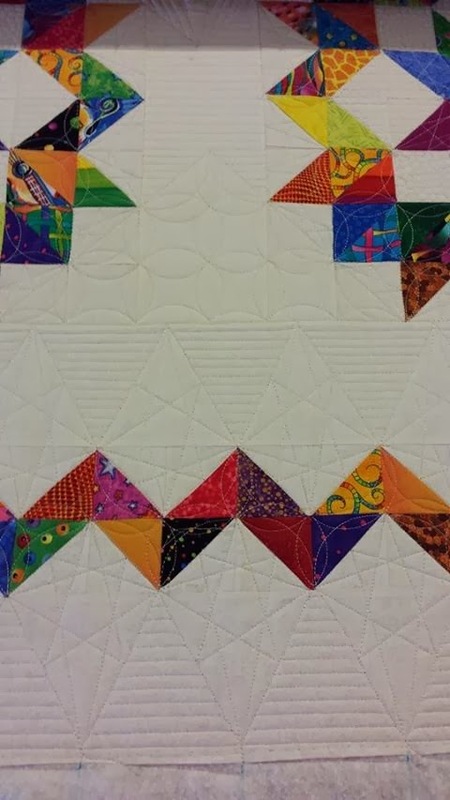 This was a fun quilt to do. AND, Elise just brought me 2 more quilts. Come back and see what I do with them! Yep, Bob! He found a wildlife panel he liked. With some coordinating fabric. He also found a Lowe's! He was so much help with set up and take down for the class. AND he drove! I think I'll keep him.